There’s a cliche Christian phrase that I believe does more harm than it does good. It may make us feel all warm and reassured, but it’s actually a lie. As a parent, part of my job is to encourage my boys to become independent. As they grow, they will rely on me less and less. Our heavenly Father wants us to become dependent on Him. As we grow in godliness, we rely on Him more and more. To help my boys learn, I give them opportunities to show their independence from me. God gives us opportunities to show our dependence on Him. I give my boys tasks I know they can handle so they gain confidence. God gives us tasks we can’t handle so we gain humility. When consoling and counseling friends, let’s stop saying God won’t give you more than you can handle. Let’s start telling the truth–God will never leave you or forsake you (Hebrews 13:5). In this world, we will have tribulation, but Christ has overcome the world (John 16:33). The Lord is a stronghold in times of trouble (Psalm 9:9). The truth of His Word brings more comfort than a cliche phrase! Amen. Thank you so much for this Word. So love this. It is the one phrase that I always say is the most misquoted verse in the Bible. 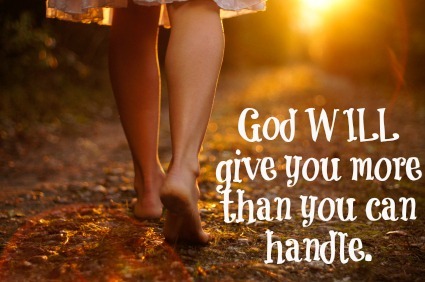 He will give us more than we can handle, but he won’t tempt us more than we can handle. Thank you for speaking out about this. I love that you remind that no matter what we are going through that we are not alone. I loved this. Thank you for posting this, and sharing what Scripture truly says! Amen! Thank you for saying this Sandra! I hear that cliche all the time and I cringe every time. I think people get it by taking 1 Cor 10:13 out of context. We will never be tempted beyond what we can bear. But you’re so right, when God allows trials and difficulties in our lives He wants us to lean on Him to get us through. We can not – and don’t have to – do it alone! Sanda, thank you for sharing this. It came at just the right time and I’ve had the opportunity to share it with others these past few days. Great perspective and something I’d never thought of before. Thank you!